Some 74 years after Franklin Delano Roosevelt was sworn in as this nation’s 32nd president — March 4, 1933 — the legacy of his favorite New Deal agency can be enjoyed to this day. The Civilian Conservation Corps, which operated nationwide between 1933 and 1942, provided employment for 2.5 million young men working out of nearly 3,000 camps. The U.S. Army supervised the rustic camps of 200 men each, who labored on work projects assigned by the departments of Agriculture and Interior, in cooperation with state governments. Besides planting 5 billion trees that helped preserve the soil of the United States from erosion — the youth were sometimes called soil soldiers in fact many of the buildings and parks they built are still standing. Local examples include the improvements to Fort Parker and Mother Neff state parks. 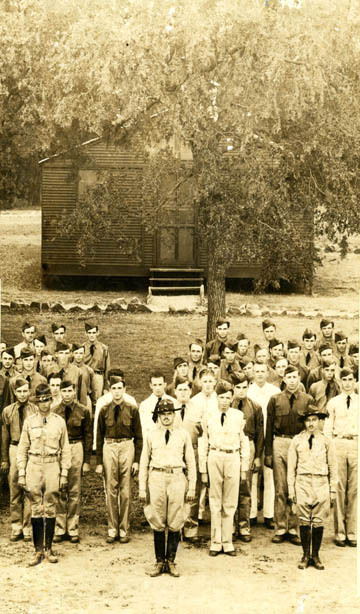 Central Texas CCC camps included No. 817 in McGregor, opened Dec. 27, 1934; No. 878 in Clifton, opened on June 19, 1933; No. 2895 in Gatesville, opened on Aug. 21, 1935; and No. 3801 in Waco, opened Aug. 19, 1935, on the grounds of old Camp McArthur. At its peak in Texas the CCC operated camps with a capacity of 19,200 men. Assignment to states was random, so workers in Texas came from all over the country. The average Texan CCC enrollee was 20 and served two six-month terms. They could re-enlist for a maximum stay of two years. Nearly 50,000 Texans were enrolled between 1933 and 1942 in the CCC, which had among its nicknames the Colossal College of Calluses and Roosevelt’s Tree Army. To join up, a young man was required to be 17-25 and from a family on relief. The pay was $30 per month, of which $25 was sent directly to the needy family. Veterans of World War I were also eligible and were housed in separate camps. Evelyn Kirk of Waco’s father, John Ross (1889-1967) served in the U.S. Army’s 12th Cavalry Battalion, Company D, at Camp MacArthur in Waco for most of the First World War. It was that service, she said, that qualified him to join the CCC in a veterans’ unit. He served in 1934, at a camp in Palo Duro Canyon. The Civilian Conservation Corps is an important part of our country’s history. But our family considers it a significant part of our heritage as well, Kirk said. Downsville native J.T. King, a 19-year-old farmer, is seen in this image with some of his CCC comrades and supervisors in front of his barracks in Gatesville, in early 1936. After long, exhausting days at manual labor, youths could, if they wanted, attend evening academic classes or participate in sports and recreational pursuits. According to a September 1934 article in the San Antonio Express, in the first 15 months of the programs establishment in Texas, 47 camps sheltering some 9,500 men had opened. And these workers had sent home more than $4.2 million in pay, lightening the state’s relief load, the newspaper reported. Ruby Jewel King, 79, of Robinson, said the CCC was a life-saver for many rural, poor families of the times. Her late husband, J.T. King, was a lad of 19 when he signed up in August 1935 and assigned to a CCC camp in Gatesville. Except for a one-week stint in an army hospital at Fort Sam Houston to recuperate from the measles, King and his colleagues worked on preparing Mother Neff State Park for its 1937 public opening. Mrs. King said that her husband’s memories of his CCC service were mostly pleasant ones. He liked to tell the tale of how, on a leave in town, he and the fellows took in a movie (Werewolf of London, 1935). That night, one fellow started having nightmares about being a werewolf, and leapt from the bunk in a sleep-walking trance to act out his lycanthropic tendencies. They emptied out that barracks in a hurry, Mrs. King said. J.T. always claimed that kid was foaming at the mouth, too. After the draft began in 1940, there were fewer and fewer eligible young men for the program. When war was declared in December 1941, all CCC work, except for wilderness fire fighting, was shifted onto U.S. military bases to help with construction there. The agency disbanded after Congress voted to cut off funding entirely after June 30, 1942. Former CCC sites in good condition were reactivated from 1941 to 1947 as Civilian Public Service camps, where some conscientious objectors performed work of national importance as an alternative to military service. Other camps were used to hold Japanese internees or German POWs. SOURCES: Interviews, Evelyn Kirk, Waco; Ruby Jewel King, Robinson; CCCalumni.org; James F. Austin CCC Museum; Handbook of Texas Online; Texas Parks and Wildlife and The Texas Collection at Baylor University. Mother Neff State Park, the first official state park in Texas, was named for Mrs. Isabella Eleanor (Mother) Neff, who donated six acres of land along the Leon River in 1916. Her son, Texas Gov. Pat M. Neff (1921-25) created the Mother Neff Memorial Park which later became the nucleus of the Texas State Park System. The park, opened to the public in 1937, is located west of Moody and now contains 259 acres in Coryell County. The CCC restored the park to its historical setting. Of the 56 state parks established through CCC efforts, 31 still exist.